Welcome to my blog, everyone! As you all know, February is National Heart Health month, with an emphasis on its impact to the health of women. 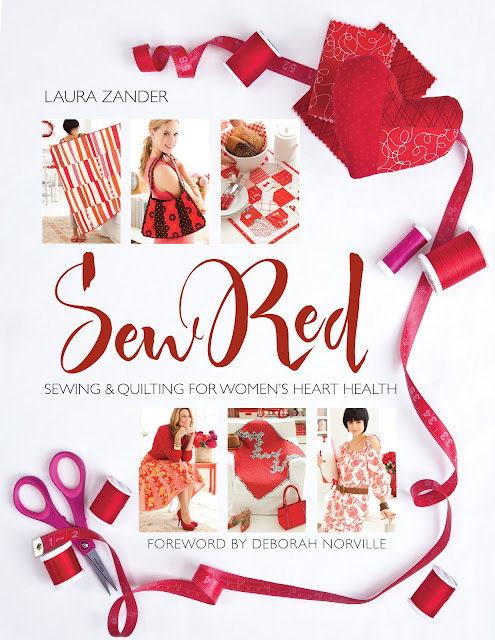 I am so proud to share with you my contribution to a wonderful new book, Sew Red, which furthers this wonderful cause. This book is the dreamchild of Laura Zander, the creative genious behind Jimmy Beans Wool in Reno, Nevada, and of course online! I had the priviledge to meet Laura in person at Spring Quilt Market in 2012 at Kansas City. She is a creative ball of energy and so fun to talk to! She published a book of knitting designs last year called Knit Red, which is a collection of projects from well known knit designers in the industry. She wanted to follow up with another book, this time centered around sewing, and asked if I would like to contribute a project. I enthusiastically jumped on board and designed this great new skirt for the book. Imagine my surprise and thrill when I saw the final cover and discovered that my skirt is featured there! Laura and I share a passion about heart health awareness. The wonderful thing about the books that Laura publishes is that the proceeds go to the American Heart Association to raise awareness and improve the treatment for people with heart disease through research. Inside the book, each designer talks about heart health and what they do to stay healthy. Heart disease runs in my family, so I work hard to do what is best for my heart. I want to be around for a long time! Both Knit Red and Sew Red are available through Jimmy Beans Wool. Just click on the book titles or the shop name to navigate to Laura's site to see more. We anticipate that the stock for the book will arrive soon, so your wait should be very short! These are lovely hardback books packed with designs from some of the best known designers in the industry. There is plenty of beautiful photography as well as easy to follow, well written instructions that are illustrated. In Sew Red, you will find a variety of projects, everything from quilts to tablerunners, bags, clothing, and other accessories. I feel very honored to be a part of such a fabulous group of designers! Here is the skirt I designed for Sew Red. It is called the Sweet Sixteen Skirt. It is made by cutting panels with a rotary cutter, ruler, and mat based on your hip size. It got its name because it is constructed of 16 main panels, with contrasting godets of alternating height at the hemline and a sweet bias trim. I chose the wonderful Moda line of fabric called Marmalade and love the way it came out! This makes for a lovely swingy skirt, but keeps the bulk of fabric to a minimum at the waistline. There are two rows of narrow elastic at the waist, so the fit is super easy to achieve. This also allows you to decide if you want to wear the skirt at your natural waist or lower on the torso. I hope that you will decide to get a copy of this wonderful book! Not only is it packed with great designs, it is for a great cause. Sweet Sixteen Skirt from Sew Red by Laura Zander, published by Sixth&Spring Books. Photos by Rose Callahan copyright © 2012 by Sixth&Spring Books/Soho Publishing. Used by permission. I am a designer of sewing patterns for clothing and accessories with a modern yet classic style.